A story-based course that introduces young children to English first through listening and speaking, and then provides a gentle introduction to reading and writing. Key features Happy House is a two-year course that introduces children to English through listening and speaking and then, in the second level, provides a gentle introduction to the written word. 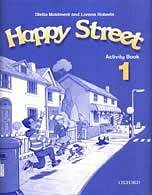 Happy House introduces children to English through an appealing storyline which combines both familiar contexts and a fantasy world. Children can relate to the characters Polly, Jack, and their baby sister, while also enjoying the adventures of a family of mice that live under the floorboards.